Dinah Pye AGSM, Dip. 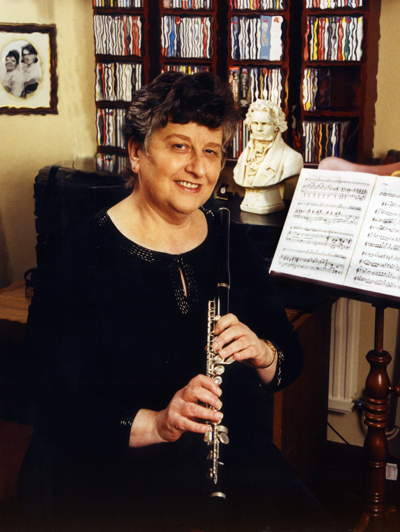 Ed., CPFS was born in London and studied flute, recorder and piano at the Guildhall School of Music & Drama and Early Music at Kings College (London) followed by a London University Post Graduate Teachers Course and a Music Consultancy Course at Reading University.She has taught in London, West Midlands and Wales as a peripatetic teacher, Head of Music, LEA advisor, teacher trainer and private teacher. In 1990, due to family commitments, she returned to her Mother’s birthplace in the Cynon Valley, South Wales, and continues to contribute to the arts, community regeneration and business development as well as running Active Music Services. 1994-2010 Dinah produced bespoke concert programme notes for the BBC National Orchestra of Wales, numerous music festivals, arts organisations and education departments across the UK. 2001 Dinah launched Active Music Services (AMS) as an eCommerce music consultancy. AMS continues to provide orchestras, choirs, ensembles, soloists, music festivals, education centres and local education authorities with bespoke concert programme notes and music education resources or all age groups. 2006 AMS purchased the Choral Catalogue from Swales Music Centre in Haverfordwest, Pembrokeshire. The Swales archive contains choral music going back over 100 years and AMS has now extended the archive to over 100,000 titles covering Welsh, English and international music for all choirs. In September 2006 AMS launched the Choral Music Centre in Wales. Dr. Alwyn Humphreys MBE, the renowned conductor and TV presenter kindly officiated at the Wales Millennium Centre in Cardiff. 2009 AMS launched an upgraded website with PayPal facilities and new choral and instrumental products. 2010 Curiad Cwmni Cyf, based in North Wales, approached Dinah to become the sole distributor of their vocal, instrumental and choral music catalogues. This partnership has resulted in both companies repertoire meeting the requirements of choirs across the world. 2014 AMS looks forward to updating it’s website and gradually adding new products to all catalogues.